This high quality polyurethane casting resin is the choice of fine artists. Optically clear, it is used where a hard, UV-resistant product is required. Because it resists yellowing and tends not to trap air bubbles, it’s well suited to cast fine art, encapsulate objects, produce rapid prototypes, create special effects, and reproduce sculpture and giftware. Unlike polyester resins, (which are extremely toxic and require the use of a NIOSH mask), AquaClear has little or no odor. Set time: 15–20 minutes. 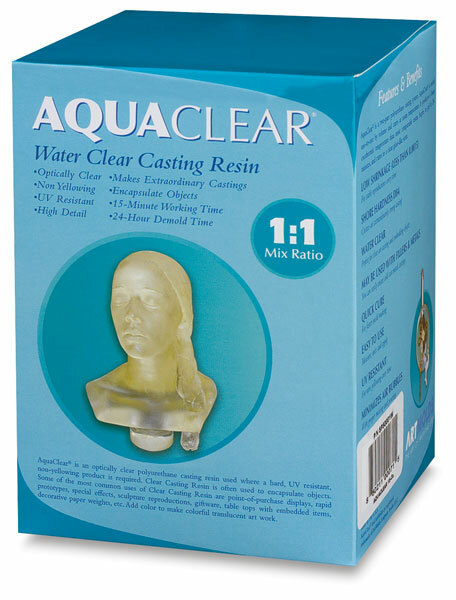 ® ArtMolds is a registered trademark.® AquaClear is a registered trademark.